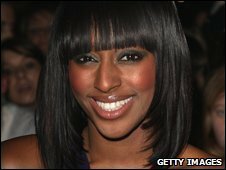 Last year's X Factor winner Alexandra Burke has beaten Robbie Williams to the top of the UK single charts after both performed on the show last weekend. Bad Boys, featuring US rapper Flo Rida, sold more than twice as many copies (185,000) as Robbie's comeback single Bodies, which charted at number two. Last week's number one, Oopsy Daisy by Chipmunk, slipped to number three, the Official UK Charts Company (OUCC) said. Alexandra's debut Hallelujah was the best-selling single of 2008. Bad Boys is comfortably the fastest-selling single of 2009 so far - beating Dizzee Rascal's Bonkers, which was number one for two weeks. Bodies' sales of 90,000 would have easily given Williams the number one in almost any other week, the OUCC said. 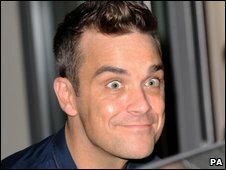 It is the 20th top five single - including six number ones - of his 13-year solo career and comes ahead of the release of his album Reality Killed the Video Star next month. Speaking about her latest success, Burke said: "I'm blown away... I've been recording my album for the last six months, so I'm hugely excited to finally be sharing my music with everyone. "I want to say a big thank you for all the support I'm receiving, I'm one very happy girl today." HMV's Gennaro Castaldo said: "Fending off the mighty challenge of Robbie on his return, shows that her fan base has not only stayed with her, but is growing as she connects with a wider audience." He added that she had created a "tremendous platform" for her debut album, Overcome, which is released on Monday. Taio Cruz remained at number four with Break Your Heart, while Jay-Z's Empire State of Mind ,featuring Alicia Keys, slipped two places to number five. Michael Buble's new entry Haven't Met You Yet was the third single to make it into this week's top 10. Meanwhile, British rockers Editors shot straight to the top of the album chart with In This Light and On This Evening, just ahead of Chipmunk's collection I Am Chipmunk which entered the chart at number two. Madonna's greatest hits compilation Celebration slipped one place to number three, ahead of Shakira's She Wolf which was straight in at number four. Paolo Nutini's Sunny Side Up jumped from number 31 to five.